Your Heroku application's journey to production begins with a buildpack that detects what kind of app you have, what tools you need to run, and how to tune your app for peak performance. In this way, buildpacks reduce your operational burden and let you to spend more time creating value for your customers. That's why we're excited to announce a new buildpack initiative with contributions from Heroku and Pivotal. The Cloud Native Computing Foundation (CNCF) has accepted Cloud Native Buildpacks to the Cloud Native Sandbox. Cloud Native Buildpacks turn source code into Docker images. In doing so, they give you more power to customize your runtime while making your apps more portable. The CNCF provides a vendor neutral home that will foster collaboration and help us leverage these cloud native virtues. Buildpacks will change and grow, but we'll continue to provide our customers with the same Heroku experience they know and love. The Heroku experience you're used to began seven years ago, when buildpacks were created. Initially they were used as a mechanism to enable polyglot programming language support on the platform. As more and more developers created buildpacks, they grew beyond languages. Today there are buildpacks for Nginx, Meteor, React, and even Minecraft. To minimize vendor lock-in, we published the Buildpack API in 2012 and removed the Heroku-specific elements. Since then each vendor that adopted buildpacks evolved the API independently, which led to isolated ecosystems. As a Cloud Native Sandbox project, we're standardizing the Buildpack API for all platforms and opening up the tooling we'll use to work with and run buildpacks under the Buildpack GitHub organization. We open sourced buildpacks because we wanted to see it spread beyond Heroku. Adopting these new container standards helps fulfill that vision by opening the door for anyone and everyone who works with containers and OCI images. What's remarkable about buildpacks' longevity is how much has changed since they first appeared. In 2012, we weren't thinking about microservices or containers. Despite these shifts in technology, buildpacks are as relevant as ever. Our original vision of an open and vendor neutral way to build apps is as important today as it was when buildpacks launched. Cloud Native Buildpacks allow us to fulfill that vision. That said, there's more buildpacks can do to take advantage of this cloud native era. 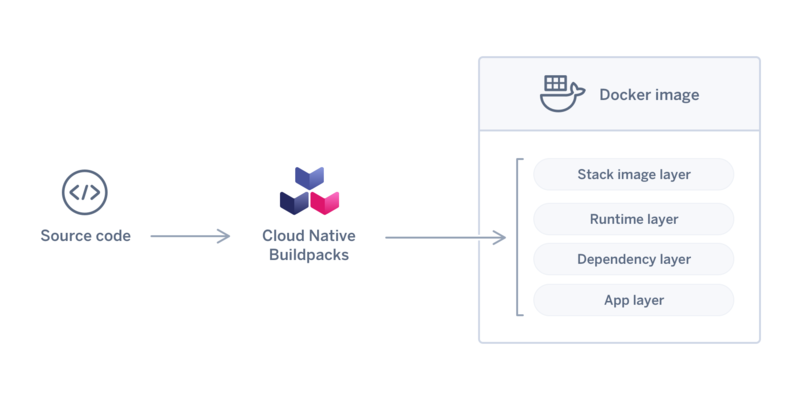 Cloud Native Buildpacks retain the simplicity that made Buildpacks popular but also embrace modern container standards, including Docker images or any other Open Container Initiative (OCI)-compatible Image. Combining these standards with our mature container runtime will improve portability and solve other problems for our users that buildpacks have not. The widespread adoption of containers across cloud providers has made container images the new executable of the cloud. Cloud Native Buildpacks will be the gateway to this environment. At a very high level, Cloud Native Buildpacks turn source code into production ready Docker images that are OCI image compatible. Let's take a closer look at how they do this. The bin/detect script, like buildpacks of old, determines if a given buildpack is appropriate for your source code. For example, a Node.js buildpack will look to see if your app has a package.json file, and return a positive result if it finds one. The bin/build script will prepare your app's source code for production. Most buildpacks will install your app's dependencies, and prepare static assets. If the buildpack supports a compiled language like Java or Go, it will install and run a compiler against your code to generate binaries. During the bin/build process, a Cloud Native Buildpack can put certain dependencies or artifacts into OCI image layers. In this way, the buildpacks can structure your layers to ensure a clean separation of concerns and optimize caching. In comparison to other image generation protocols, such as Dockerfile, Cloud Native Buildpacks are app aware. They know how to install the runtimes and frameworks you use, and automatically provide security updates when possible. They know how to execute your app's build tools—often better than you do—and they know how to start your app with the best configuration for a given environment. Get started hacking Cloud Native Buildpacks today by forking one of the Buildpack Samples! Read up on the implementation specifics laid out in the Buildpack API documentation, and join the public Buildpacks Slack. Even after seven years, there's never been a more exciting time for buildpacks. As we continue this cloud native journey with buildpacks, we look to you for feedback that will help us prioritize and direct our efforts. Whether you're a buildpack user on Heroku, a buildpack author, or another cloud provider, we need your feedback to shape the future. Join the conversation.